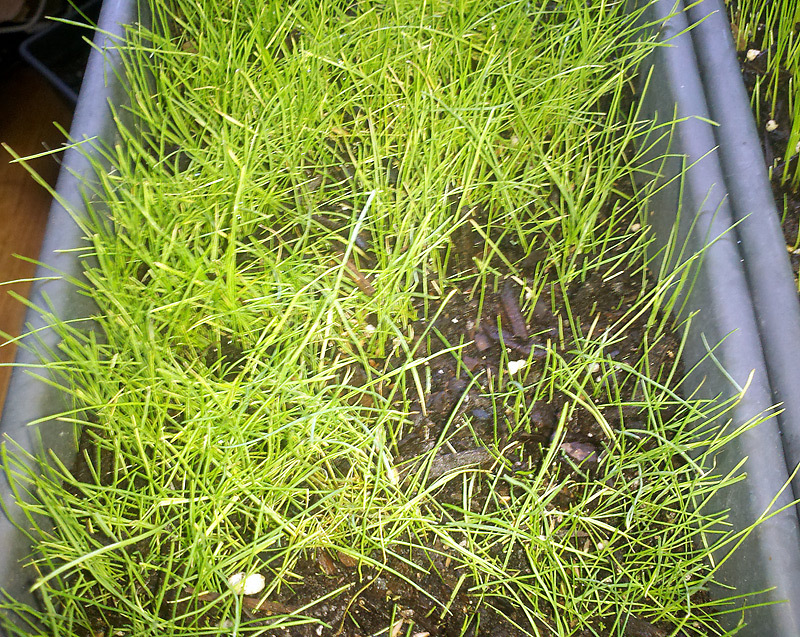 A quick update on the two grasses I'm growing indoors in containers. One's doing well, ran into a problem with bugs in the other used neem oil to kill them. Happened to catch it all on video which is included further down. The picture on the left is the Jonathan Green Black Beauty at Day 6. 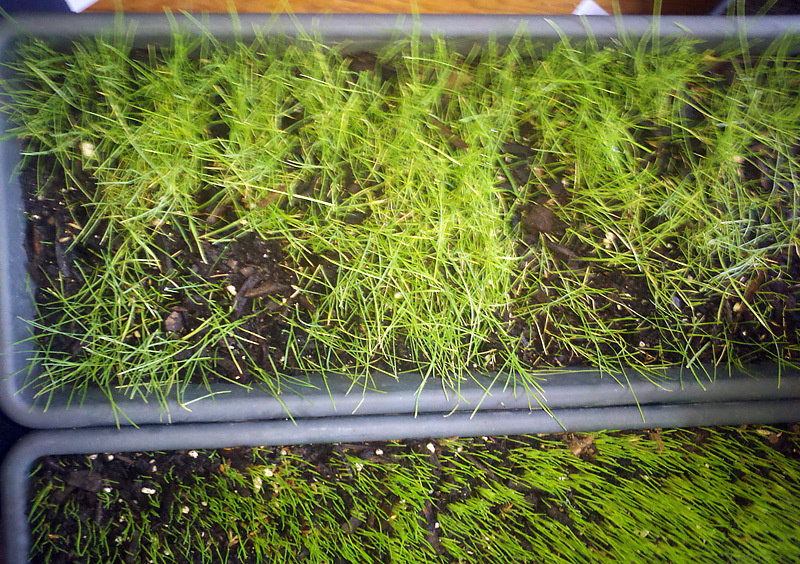 It has germinated very well and some shoots are still popping up. Average blade length seems to be about an inch with some about 1/4" and half a dozen or so that have grown about 2" long. Black Beauty displays significantly more phototropism compared to the Jonathan Green Dense Shade I have growing next to it. During the day the Black Beauty blades are pointing towards the window. After the sun starts to go down I turn on the room light so it can get a little more light and the blades start to stand upright fairly quickly. I'll be able to demonstrate this a little better in a few days. So far it's looking pretty healthy. 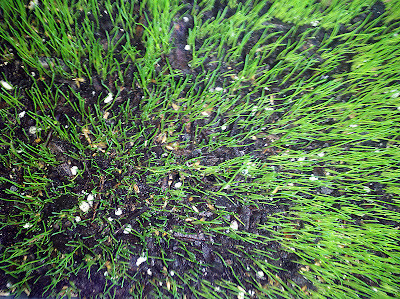 Germination was a lot better and more even than the Dense Shade and that's most likely due to the age of the Dense Shade. It was an old bag that was 3 years old. I should have taken the time to buy a new bag. These are pretty ideal conditions for the lawn other than sunlight. Temperature controlled environment, good pH, growing medium rich in organic material, ability to keep the seeds moist throughout the day. The grass is getting some indirect sun from a couple of North facing windows and I supplement that with some artificial light from time to time. 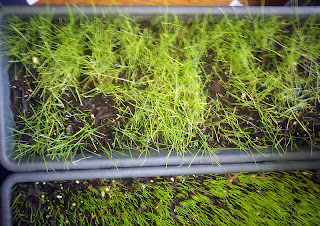 From the top it doesn't look as impressive yet but you can see how even the germination was. In a week or so I think it will fill in much better. From the side it's already looking pretty good. The Dense Shade on the other hand hasn't been fairing so well on Day 22. On Day 17 it was looking decent except for some areas with poor germination which as I mentioned was likely due to the age of the seed. 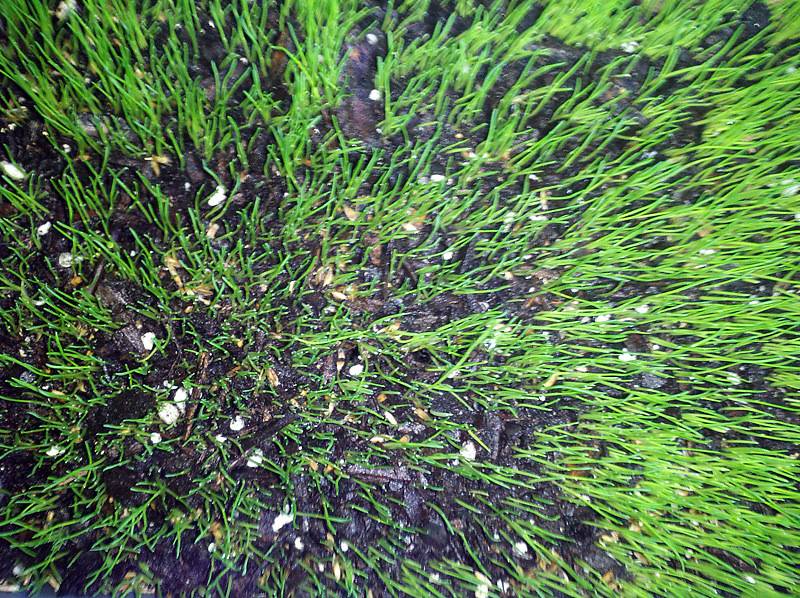 I had topdressed with some additional organic potting mix, added more seed and another small layer of potting mix. I also switched to filtered water at that time. As you can see it's filling in a bit but the grass has gone a bit limp and lost some of it's color. 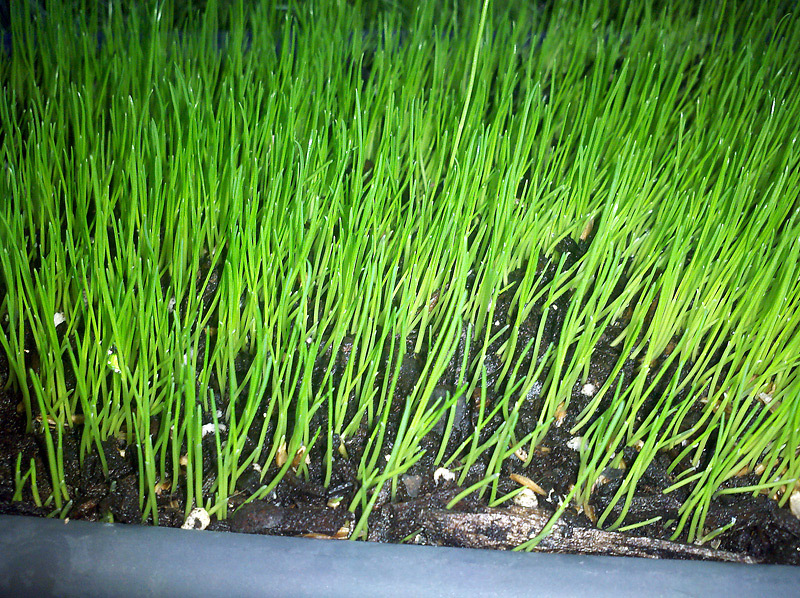 The growth seems to have stunted although some of the new seed is germinating and filling in the bare areas. 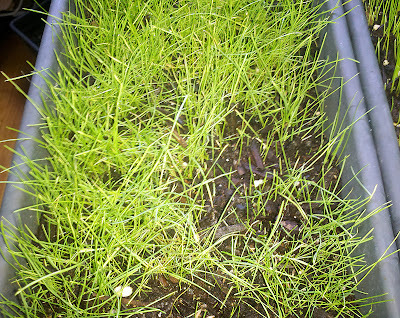 Some of the older grass tips have browned. It looks like insect damage and I did see a couple of small critters on the grass which I squished. Not sure what they are or how they would have come inside. They were tiny flying bugs. I haven't seen any on the Black Beauty which claims to be naturally resistant to some insects. Uhm... since I wrote that last paragraph I found out it's definitely bugs! I'm doing a time lapse recording of the growth and what I thought was some sort of video artifact is actually little tiny things crawling around. 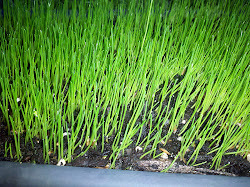 I sprayed some Organica K+Neem on them which seemed to work pretty well. K+Neem is no longer made but other products like Green Light Organic Neem Concentrate are still available. Neem oil is a contact killer and doesn't have any residual effects. In a couple of days if I still see any I'll spray again. Here's a portion of the video. You can clearly see the white bugs (larvae?) crawling around on the potting mix on the bottom right. In the middle of the video I sprayed the neem oil which put an end to them. The bugs are really tiny so you might need to watch the video in HD and fullscreen to notice them. Black Beauty is supposed to be naturally insect resistant. I'm not sure if that's why nothing is crawling on that side or not? After some research and having a closer look at one of the adult ones, it seems they were fungus gnats. Some more Googling and it seems other people have complained about gnats in Jungle Growth Organic potting mix. Don't know if they came in the mix, found they're way through a slightly damaged screen came in the door or hitched a ride on a pet. I'm going to keep a close eye on it. Have noticed a couple of gnats since I posted this but don't see the gnat larvae crawling around on the soil like before. I'm hoping that the Dense Shade perks back up soon. The topdressing might have stressed it, the bugs surely did and while the neem oil shouldn't harm the grass too much could cause it problems. It doesn't look as good compared to the Black Beauty on the bottom but when the Dense Shade was young it looked much better too. We'll see what happens in the next few days.